Tropical Storm GERT is Here! Seven Down, How Many More to Go? 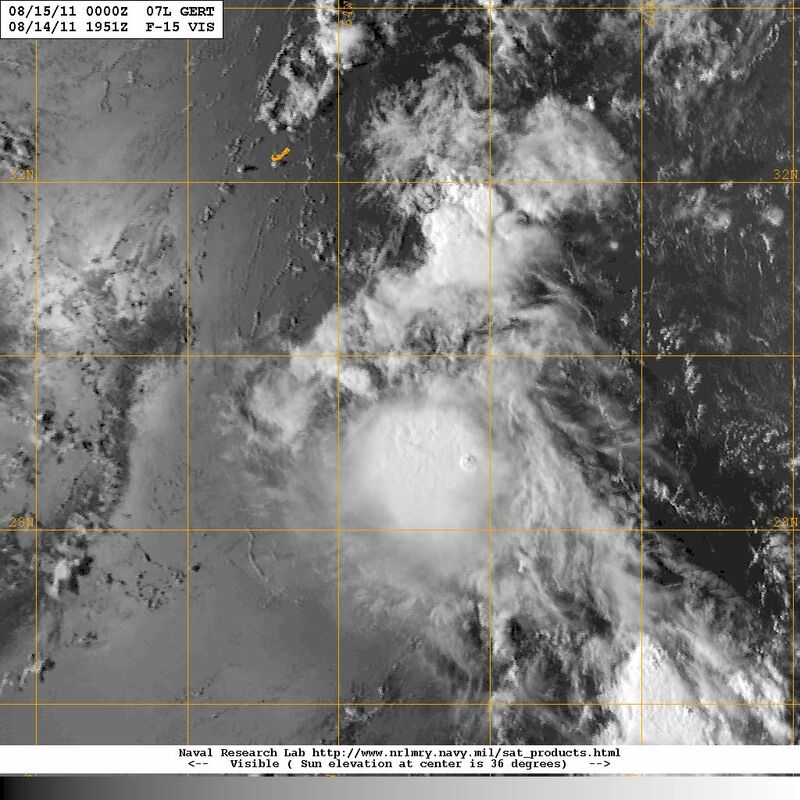 Today, Sunday 14 August 2011 a new tropical cyclone, GERT. the 7th named storm of the 2011 Atlantic Hurricane Season was generated over the open water of the central north Atlantic. Late in the afternoon GERT was located some 200 kilometers to the south by southeast of Bermuda; with the storm tracking north by northwest at 12 kph GERT appear to be in route to cause significant precipitation and stormy weather over Bermuda in the early morning hours on Monday 15 August, 2011. Visible light satellite image, courtesy of NASA, showing Tropical Storm GERT on 14 August 2011 as it moved north by northwest toward Bermuda, some 200 kilometers away, with maximum sustained winds of 75 kpk gusting to 95 kph. While GERT is in progress toward BERMUDA some 500 kilometers to the north of the island there is Tropical Wave 96L showing some signs of organization as it is being pulled in the wake of now-dissipated-and far-away Tropical Storm FRANKLIN. 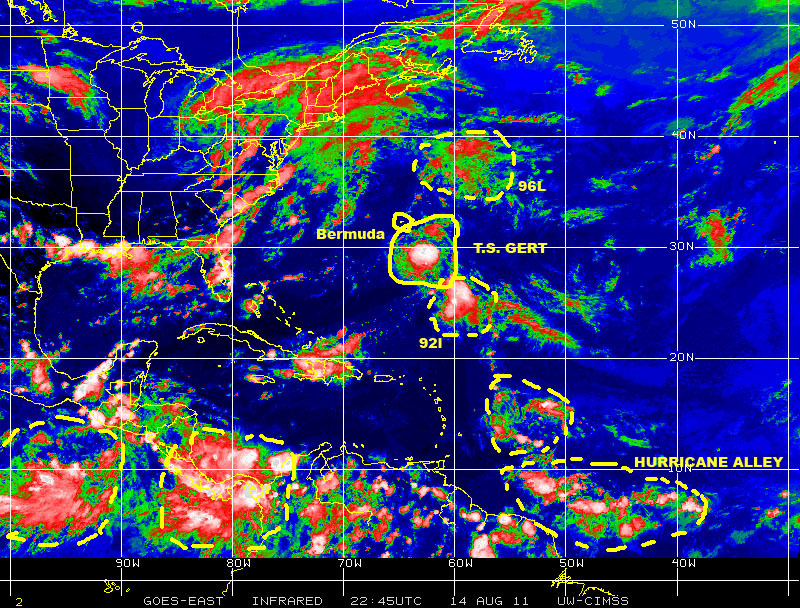 There is also Tropical Wave 92L, which has been active for the past four days, following in the wake of GERT and given a 30% probability, at this time, of developing into a tropical cyclone in the next 24 – 48 hours. Color-enhanced infrared satellite image, courtesy of NASA, showing current cyclonic activity near Bermuda on 14 August 2011. So the Central North Atlantic is hosting quite a share of cyclonic activity as the 2011 Hurricane Season continues to evolve at a higher level of activity than during the first 60 days. Looking farther south and east from were all of this cyclonic activity is currently taking place to aspects are noticeable: (a) new cells of disturbed weather have moved over ‘hurricane alley’ once again completing the continuous “belt of tropical activity” that had been disrupted over the last 2-3 days, and (b) there are at least three quite large cells of disturbed weather over equatorial Africa, which as they continue to move west appear to be destined to become the next generation of tropical waves to emerge over the eastern Atlantic to march westward over ‘hurricane alley’ or, perhaps, to take the northwesterly detour FRANKLIN, GERT and tropical waves 92L, 93L and 94L have taken over the past few days. Whatever course this future tropical waves take will determine whether the next round of tropical cyclone activity will generate over the central north Atlantic or if we will see a return of cyclogenesis in the Caribbean or over the Antilles. Color-enhanced infrared satellite image, courtesy of NASA, on 14 August 2011 showing several large tropical waves or cells of disturbed weather, withpotential for cyclonic development, marching west over equatorial Africa and the eastern Atlantic. 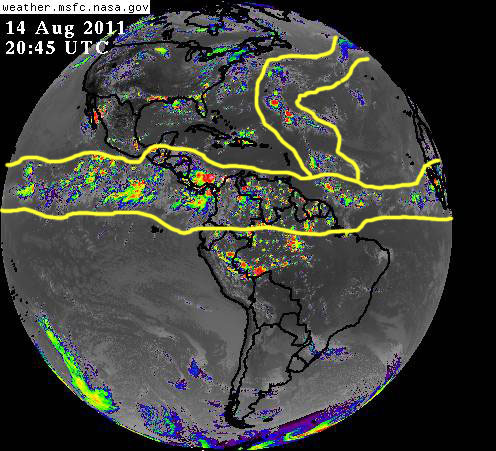 Composite full-disk satellite image of Earth's western hemisphere on 14 August 2011 showing the belt of tropical activity circling the planet, and the northwesterly-northerly 'detour' that generated last week to feed the current bout of cyclogenesis near Bermuda. 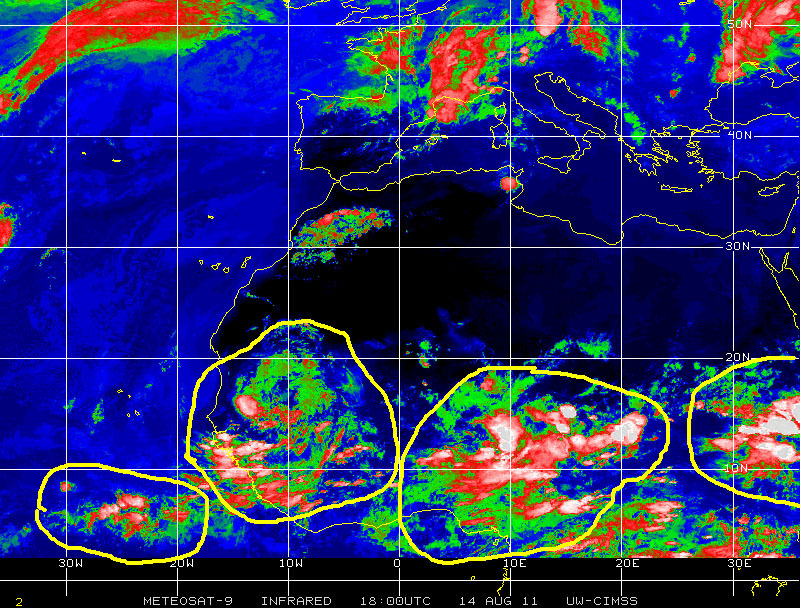 While we witness this surge of cyclonic activity over the central north Atlantic, we will do well by continuing to monitor potential contributors to cyclogenesis in the larger Atlantic basin as they continue to appear over equatorial Africa, the eastern Atlantic or in any of the various sub-basins [Caribbean, Gulf] in coming days and weeks. With 60% of the ‘official’ annual Atlantic Hurricane season still to come given the level of activity seen so far, and the historically most active segment of the season expected in late august and September, it behooves all interest in the Atlantic basin to remain vigilant, to pay attention! To be prepared!! And, above all, to practice MITIGATION!! !